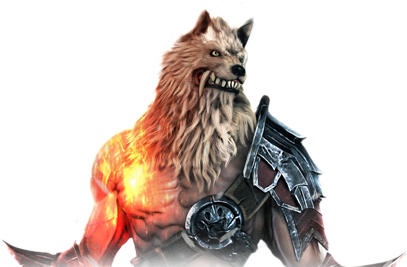 Lycans are formidable wolf creatures which were once infected by an incurable virus, losing their human forms and mutating into beasts. Thanks to their unbridled power and heightened instincts they make exeptional close combat fighters. Fearless in the face of conflict, they always seek out the front lines. Crimson Wolf Soul Become possessed by the soul of the crimson wolf. Indigo Wolf Soul Increase the attack speed and evasion of your entire group. Shred Tear into your opponent with a powerful blow. Wolf's Breath Attack your opponent with a deadly gust of air. Wolf's Claw Shred your enemy's armour. Wolf Pounce Attack your enemy in a leap attack. This page was last modified on 18 July 2018, at 10:07.